Shown above: 1 Raffles Club Chair, 1 Raffles Loveseat, 1 Raffles Sofa, and 2 Raffles Side Tables. 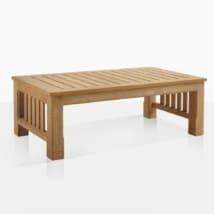 Handsome, ornate and dignified; the Raffles Teak Outdoor Furniture Collection is a robust, classic mission style collection that will make a wonderful impact in your outdoor living room. Named after the famous Singaporean hotel ‘Raffles,’ and keeping in with its flavor of colonial style, assured elegance and a timeless design; all integrated into 6 stunning pieces. 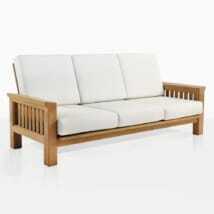 Showcasing the wood beautifully with a thick, substantial, linear frame with finer cuts of Teak in opposing lines; the style of the Raffles Teak Outdoor Furniture Collection echoes that of the Mission Style of the early 19th Century, coming out of San Francisco, which focused on master craftsmanship resulting in quality pieces that last a lifetime. 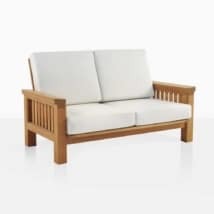 The Raffles Teak Outdoor Furniture Collection boasts a Sofa, Loveseat, Club Chair, Coffee Table, Side Table and Ottoman; each piece designed to work wonderfully on its own or as part of a bigger group. Devise a space where you can take a breath and relax away from the busyness of your life; place a Raffles Sofa as your centerpiece, frame it with a Raffles Loveseat and 2 Raffles Club Chairs and you have a superb seating arrangement that caters to many people, place a Coffee Table in the middle to assist in after work drinks and tapas. After a singular to meditate, read your favorite book, enjoy sweet solitude? 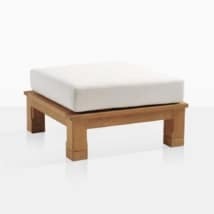 Set a Raffles Club Chair up with a Raffles Ottoman and Side Table for the perfect little position of sturdy comfort! 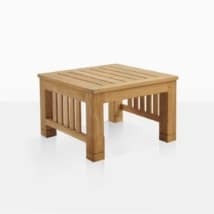 From the sustainable farms in Indonesia comes our signature A-Grade Teak: beautiful, solid and long lasting; this is a product that has proved time and time again to be at the forefront of excellent, long lasting furniture. 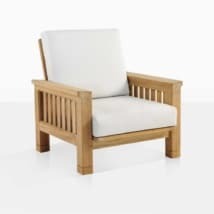 Our Raffles Teak Outdoor Furniture Collection is made from this fantastic product and topped off with divine Sunbrella® cushions, available today in classic, elegant Taupe, Canvas or Coal, and available with a short wait are custom colors – just click the Sunbrella® logo on this page and choose a color that suits your personality and your space! The Raffles design also carries over to our dining chairs and a low recliner and ottoman option, just type ‘Raffles’ into the search engine at the top right of this page to see what else we have in store for you!